I was washing the boat and I noticed something that was a light color moving in the water. It was pretty big and I wasn’t sure of what it was. Then the snout came out of the water, it was drinking the fresh water runoff from the boat scupper. According to the other residents it is one of three manatees that come around. There are two adults and a young one (about 1/2 the size of the adults). They have figured out what boat washing sounds like and come over to drink the fresh water. 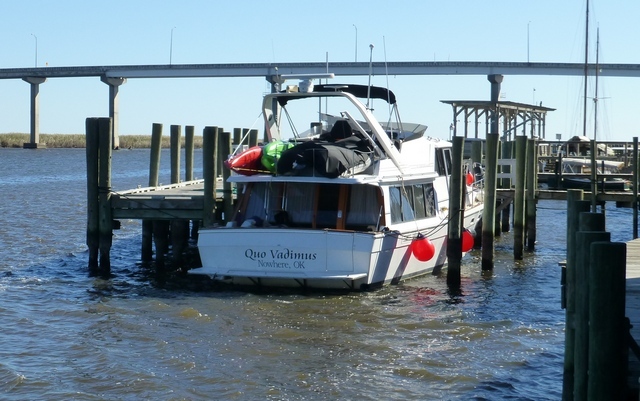 Quo Vadimus is docked at her winter home! We are done what I consider to be the first ½ of the trip, but in time and distance it’s the first 2/3. We are in Tavernier Florida (just south of Key Largo) and will be here for at least the next 45 days if not longer. Total Miles Traveled: 3656 nautical miles (and for my distance challenged Looper friends that is 4165 statute miles) Philadelphia to San Francisco and back as far as Des Moines Iowa. Or since we are a boat, it’s the distance from the Chesapeake Bay to Scotland and then a little more. Average miles per hour: 7.2, about twice the average walking speed. Or half the average biking speed if you bike long distances. Most Miles in one day: 168 (nm) (The Florida crossing, which took two days. In an actual “day”, 96.5 (nm) from Kimswick MO to an anchorage on the Mississippi River). – Rub rail repair in Brewerton, NY. – Generator start switch replacement, Big Chute, ON. – Propeller change and hull fiberglass ding repair in Little Current, ON. – Haul out to check bottom and props from the river run, zinc replacement and repair of line cutter, Fairhope, AL. Thats a shame, we really like the Quo Vadimus. – Fly-bridge and inside driving position with inside access to the fly-bridge. – Instrumentation (Auto-helm, Radar, GPS Chart Plotter, etc.) Of these the Auto-helm has been the most useful. The radar has only been used on the overnight crossing and thee foggy mornings that we could have not gone out in. The 45′ Bayliner is the upper end of something that I can single hand sail. – For the loop, 45′ is the upper end of easy to lock and dock. The 4588 high profile catches the wind. With doing a new dock almost every night, it can be a challenge. – Because it’s an older boat there are some age defects, The initial purchase had us replacing things that were 20 years old. But the boat was well maintained mechanically so that really hasn’t been a problem. We have a pilot house leak I’ve been fooling with for 4 months. One of the things we bought that has paid for itself in happy times is an island bed matress with real innerspring and foam topper. – The island bed isn’t walk around, getting into and putting clean sheets on is a challenge. The overall cost has been below what I expected. I had budgeted 1 gallon of fuel for every nautical mile, I’m getting about 1.5 MPG. That and a lower cost of fuel has cut $6,000 off my fuel estimate. With a 40′ boat I would have saved almost $2,000 in dock fees, about 3% of our overall budget. If we had unlimited cash resources, maybe. But at the time (2011) this was the right boat for the right price. I really haven’t done a boat search in the last few months to see what is out there that would fill our requirements list. No problem, thanks for the questions! We were anchored out overnight in the Everglades National Park. We were fairly close to shore and near some banks in the water. It was blowing pretty good (15kts) but we took down the flags and the bimini to make the boat as aerodynamic as possible. Put a solid anchor down with 140′ of chain, twice what’s needed for 9 feet of water. Had a good set, bridles out. Susan had phone coverage, I had limited internet. I got full internet about 10 mins closer to the keys. The Florida Bay was a mid-level chop at the water. To some extent chop is worse than waves. A wave comes, lifts the boat and moves on. Chop smacks the boat and moves on. Since we sleep in the bow forward cabin, lots of slaps. I slept for a few hours and then went up and slept in the salon. No slap sounds, but I did have weird dreams that the actors in “The Big Bang Theory” wanted to ride with us. The full moon made the nightly checks pretty easy. Early on one of the clamps for starboard bridle broke, but the port one held on. We were turned a little into the wind, but we didn’t have much bobbing around. I did snub off the chain so it was not tugging at the winch all night long. The drag alarm worked well, we moved very little at night and when I looked at the distances and angles, it mostly had to do with the wind direction shift over night. In the morning we found we had picked up two sailboats. Hard to say if they had planned to stay there or since they saw us decided it was safe. But we were up and gone before they had any activity going on, so we couldn’t ask. Up anchor at 7AM went well until Susan noticed a crab line on the anchor. I encouraged her to pull in the muddy mess, trap and all and we may have crabs for dinner. She declined and sent it all back to the bottom for some other sailor to collect. We headed across to the keys, skirting the Everglades Park Markers. We notice right away that the traps stopped well short of the boundary line. So where we needed to go through cuts in the bars we went the marked route (and fought the crab traps) and when possible hugged the Federal line. Other than crab traps and staring into the sun for 3 hours it was a great trip. The wind had slowed, the chop had decreased and we moved along pretty well. There were two cases of “flippy fish” where finglings come to the surface and try to get away from a predator. This works a little until the gulls and pelicans figure it out. Then it’s havoc below the surface and havoc above the surface. We got into our “Florida Winter Home” just before lunch. Susan did her tie up magic, figuring where lines and fenders needed to go and judging the tide and the activity of the wind. So we are secure in Tavernier for the next 100 days. Once that was done we walked a few blocks to a Cuban deli for Cuban sandwiches and Corona’s. Welcome to FLORIDA!!! For the next few days we are working on a 5 page list to get us read to go back home for three weeks. Lots of people to see, places to go, etc. We are looking forward to it. To our Looper friends, we will be back 4 January, stop by and see us then. Very foggy this morning, we didn’t get out of the marina until 8:30 AM. The fog was still out on the Gulf, we had the radar running for the first two hours. About a mile of visibility. Lucky for us there were no crab traps outside of Marcos Island. The first ½ of the trip was pretty tame, we were well outside the crab trap zone. The second half had lots and lots of traps for us to make our way through. We saw two batches of dolphins. They came over to check us out, surfed for a few moments and then were gone. We think that the ICW dolphins are more used to people and being fed, that’s why they hang out more. We saw three sea turtles on the trip. The last one was huge, about the size of our salon table. We turned away to keep from hitting it. It looked up at us as we went by, giving a hard stare before diving under the waves. We are anchored just off of Sandy Key in about 10′ of water. We have 130′ of chain out, about twice what we need. We’ve closed up the bimini so it does not act like a big sale and furled all of the flags. It’s amazing how loud the Looper flag is on the front bow rail. We started off the evening with an orange full moon. It’s now white and putting a lot of light out onto the water. I can clearly see the island in the light. The nice thing is the moon won’t set until the morning, so we will have light all night long. We also set the drag alarm and will make sure we take it below with us. The nice thing is that if we do drag it will be away from Sandy Key. We have about a mile of clear space behind us before we start seeing crab traps again. The water is a light chop since we are well into the Florida Bay. We went slightly over 70 miles today with another 35 for Monday. Looking to be in the marina around noon. Today is a short day, only about 40 miles from Sanibel to Marcos Island. It started off very well, the marina delivered a bag with warm blueberry muffins in it at 7:30 Very nice. I had done a check on the fuel filters the night before and both were on the line of needing to be changed. Since we will do 150 miles across the open Gulf in the next three days I decided to change them out. Only took about 15 minutes to do both sides. After getting rid of the filters and fuel we were all set to go. It was another pretty day as we motored out in the Gulf. We had a great view of all the condos and hotels that run along the beach. Not very many crab traps or dolphins today. I’m not sure if it’s because I’m running about 2 miles off shore in the 30′ water. In any case the auto-pilot did most of the work today. About 1PM we turned into the Marcos channel and threaded our way around to the marina. There is lots of shoaling and I was given the instructions to “hug the greens” on the way in and out. Marcos is an island that is made up of 100′s of little canals. A lot like you see in North Ocean City MD on the bay side, but really ramped up. I’m going to guess that less than 25% of the houses don’t have waterfront. The largest area without canals is the country club, but there are two 18 hole courses there. We were on a floating dock, so we didn’t need to worry about the tidal shifts. We would need to pay attention Sunday morning when we go out, with the almost full moon the low tide will be about a foot lower than normal. Lunch was at “The Snook Inn”, named after the Snook Fish. It’s on the point of Big Marco Pass and has a great waterfront view. 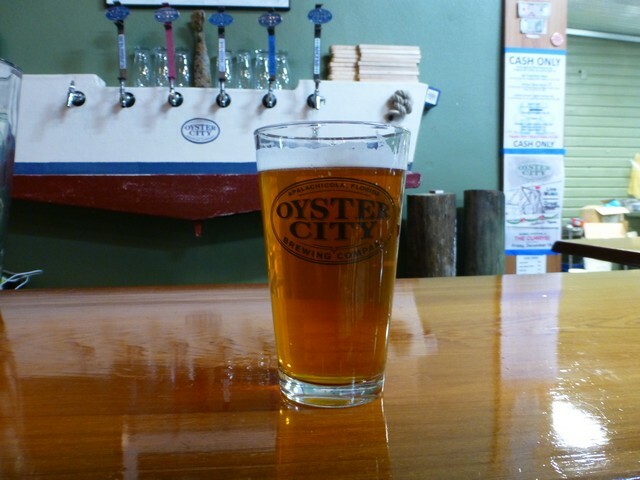 It’s one of the locals dock-n-dine favorites with two dozen slips for boats. We had fried shrimp, fried scallops wrapped in bacon, conch fritters and french fries. Susan was super pleased they had Infamous Goose Sauvignon Blanc wine. She had it for our anniversary dinner three years ago and has been searching for it since. After lunch we split up, Susan went back to the marina to look at shorts and new boat shoes. I headed down to the “Marco Island Brewery”. They have about 50 beers on tap and I did 10 of the 2.5 oz tasters. Some new favorites like “Breckenridge Brewery Vanilla Porter” and “Goose Island Muddy Imperial Stout”. Sadly their featured stout the “Goose Island Bourbon County Stout” fell in my ugg category. They condition it in used bourbon barrels. And I think they also dump bourbon into it. In any case it tastes like a beer flavored bourbon. With a 14.2% alcohol by volume (ABV) it also has a strong alcohol burn. I went back to the boat to find Susan in full nap mode. While she slept I got caught up on the blog posts and other internet stuff that I had not had a chance to do with the long travel days and busy evenings out. At 5:30 PM we pulled our folding recliners out and got ready for the Marcos Island Christmas Boat Parade. 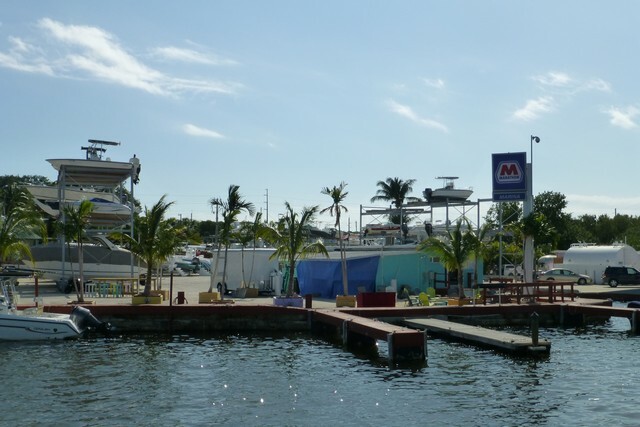 The Rose Marina is perfectly located, all of the boats would cruise by our dock. About two dozen boats were in the parade. Our favorites was a catamaran that had the mast and all the rigging wrapped with lines. It looked like a giant tree from a distance. There was a small boat with Santa, a tree and a nativity scene on it, something for everyone. One of those 8′ blowup snowman was featured on one bowrider. Santa driving his sleigh was on the roof of a pilothouse boat with the raindeer making a big sweeping turn down to the deck and then up to the sky on the bow pulpit. 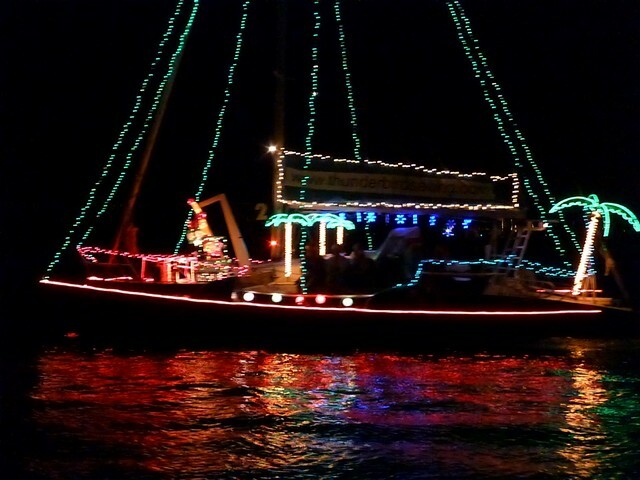 Our boat neighbor was part of the parade, they had icicle lights around the boat on the handrails. They had packages aboard that were lit up and the two young girls had antlers. Very festive. After the last boat went by, Susan made us pulled pork tacos for dinner. It was nice to eat in on the boat and not be getting back late. We both read for a little while and then it was off to bed. We quietly slid out of our slip at 6:40 AM. Just enough light to see the markers to get out into the Gulf. We are doing 70 miles today and I wanted to make sure that we got to see Captiva and Sanibel in good light. The area around Captiva and Sanibel is the setting for a number of the “Doc Ford” book series by Randy Wayne White. I’ve been a fan of them for years and wanted to see what the area looked like. The weather helped today, there was a light wind from the east and the Gulf was pretty flat. We were able to go about 9.1 kts (about 10.5 land miles) per hour. Not many crab pots, far fewer than the ride into Dunedin was. Not many dolphins out in the Gulf either. All of that means it was a pretty boring ride for about 7 hours. 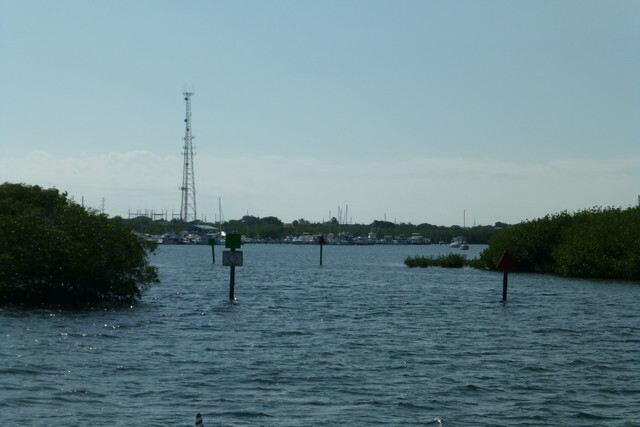 Around 1PM we made the turn into Boca Grande Pass, the entrance to both Pine Island Sound and Charlotte Harbor. Punta Gorda FL is to the north. It’s supposed to be very pretty. We will rent a car and come up to see it. The crew of the Mara Beel will be there across the winter, we’ll try to see them. We turned south into Pine Island Sound. 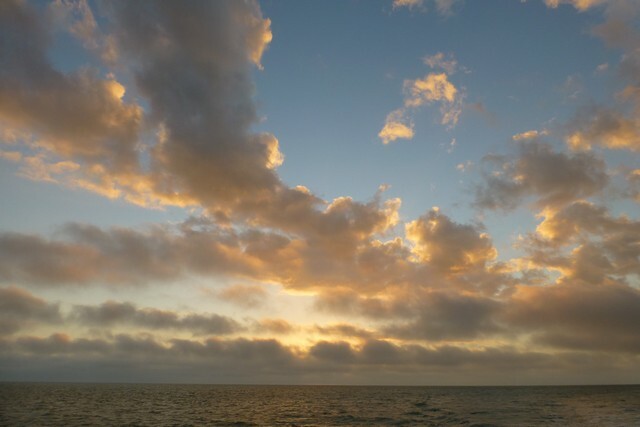 The sound is bounded by Pine Island to the east and the four barrier islands Cayo Costa, the Captiva’s and Sanibel. The sound is dotted with a number of small islands. The water in channel was 10′ deep enough for us. If we wanted to go to any of the islands we would need a flat bottom skiff, the water depths are only a few feet. This would be a perfect area for my Adventurecraft. About ½ across the sound it started to rain. The forecast for the last few days and the next few is 10% chance of rain. Since the forecast comes out of Miami, it covers a huge area. So the 10% means “about 10% of the area will see rain today”. To the west and south there were clear blue skies, so I knew the rain wouldn’t last long. During the transit we met a number of pods of dolphins, sometimes a lone adult, but on two different occasions the pod was 4-5 and there was a baby in the group. Susan got lots of pictures and once we get some more wi-fi (and time) she will get them uploaded. The Sound is very pretty, I can see why people want to live down here. It does not freeze this far south, so it’s a good place to be if you are done with snow and ice. From Pine Island we moved into the San Carlos Bay. Sanibel Island is hook shaped, it’s around the bay. This means very calm waters. About 2:30 PM we nosed into the canal that lead to the marina. It’s tucked behind a row of townhouses on a canal. Lots and lots of really big boats. We did the basic boat thing of getting pumped out and 220 gallons of fuel. Due to problems with the pump(s) we were not done until 4PM. So much for arriving early and seeing the town. An old family friend of Susan’s stopped by to visit. After getting the 7 cent tour (inflation) we hopped in their car and drove through Sanibel. 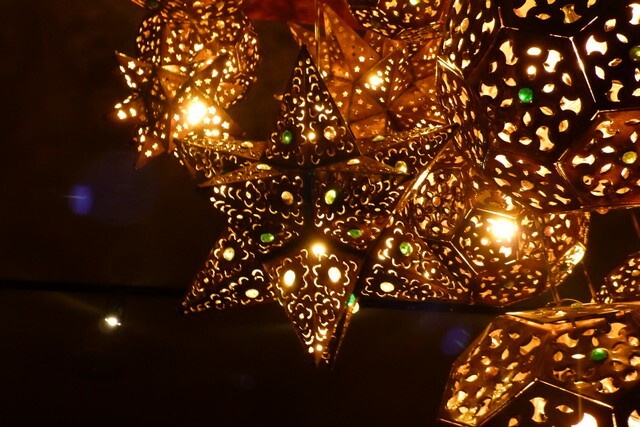 Tonight was their festival of lights, so everyone had their houses / businesses lighted. There was miles and miles of luminaries lining the sidewalks. It was very pretty, and helped remind us that it’s just 3 weeks until Christmas. But it was a little weird that everyone walking around had shorts on. We went to “Doc Ford’s” restaurant. It’s a small chain that was opened by the author of the “Doc Ford” books and some friends. It’s also a Rum Bar, they have lots and lots of different kinds of rums, and about a billion rum drinks they can make. I stuck to the basics, I had the Doc Ford Ale and the Circus Time IPA. Both are local brews, and both were pretty good. Food was very nice. Susan had the grouper dinner, I had the ribs and smashed potatoes. The ribs were falling off the bone, very nice. Our friends had two different shrimp dishes and raved how good they were. Our friends are Gold Loopers, they traveled aboard their Mainship Trawler, the Tony M and completed the loop in 2011. Most of the dinner conversation was about the loop and things that we should see and do in Florida. We all agreed that we’ve missed lots by making these huge jumps down the Florida coast. They did think that our plan of renting a car and coming back was a good one, we wouldn’t need to worry about the January weather. Of course I purchased a “Doc Ford” tshirt on the way out! We got back to the boat and crashed, it had been a long day for us. Only three more travel days to our long term slip! Wow, day 5 of wearing shorts!! WOOO!! Short trip today, we will move from Bradenton, FL to Sarasota, FL. Car distance 14 miles, boat distance 24 miles. Nice day, a little wind and a little chop in the Tampa Bay. We got our daily dolphin shows, we had a baby leaping off the starboard side for a few moments before Mom call it home. We then got three large ones surfing the bow wave for about 10 minutes. Lots of McMansions on the way, one of which is the Ringling House. Arrived at Marina Jack, this is a happening place. Lots of big boats (60+). Great facilities, huge restaurant with live music. I’m listening to it now, it’s an 80′s cover band, that should clue you into the average age of the boaters here. Ate lunch and then got picked up by Susan’s friends. They decided to skip-school today and play with us. First stop was for me to mail a package at the post office. Now you are thinking I’m scraping the bottom of the barrel, but hang in with me. Got there and found 15 people in line in front of me. (Yea, you been there). BUT they had 6 count them 6 windows open. I was back out in the Florida sunshine (72F) in under 5 minutes. Go USPS! Our first tour stop was the Marietta Museum of Art & Whimsy (http://www.whimsymuseum.org). Very cool, it’s a big building filled with quirky art projects. Some of the installations are interactive. In one room the more you yell and make noise the more the disco lights fire up. In the back is a garden area with fountains, orchids growing in trees, pigs that can fly, etc. If you go, check out the gator in the parking lot. His head is made of recycled pliers, spark plugs, etc. 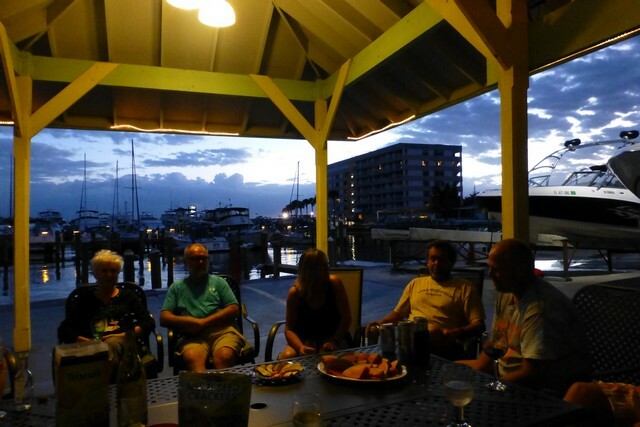 Our Sarasota friends had never been there, so it was a special visit for them. They now have a must visit place for new people in town. The Ringling Museum is funded by one of the Ringling Brothers that ran the largest circus empire in the US from 1920 to 1956. A 150 car train would pull into town at 4AM and by noon the first acts were performing. Last show at 8PM, done by 10 PM and the last part of the train would pull out of town at 2AM to start the cycle all over again. Lots of train cars, trucks and trailers. The biggest part is a 5,000 square foot miniature Circus setup with all the trains, animals, performers and of course The Big Tent. It shows all of the infrastructure and planning that goes into moving a small town of 4,000 people and 10,000 animals via rail, set up a mini city, do full day of performances and tear it all down and move it again. I just loved it. I spent hours and had to be hauled away from it to see other things. After spending 4 hours with circus folk and the upper crust of society, it was time for dinner. We ended up at an Irish pub across from the marina. While the expensive place in the marina is not animal friendly, the pub is. So we got a picnic table on the beach and had beer and great food. A nice night to sit out and with the full moon only days away, lots of moonlight to see by. A great time was had by all. 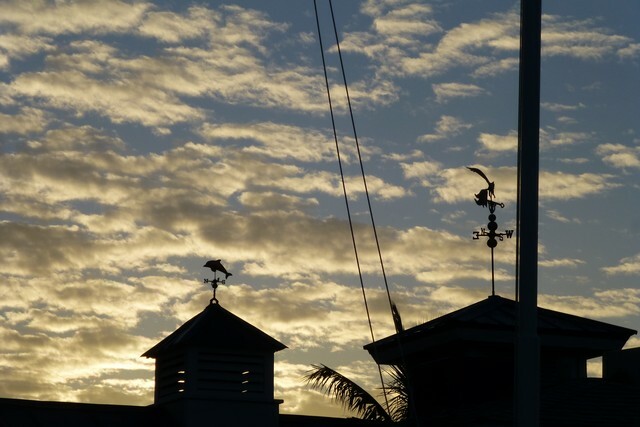 We hope to see Susan’s friends again in the keys, we will set up some deep sea trips for fishing for tuna and grouper. I was also able to take a few moments to wish my brother a happy birthday. He was out at his favorite place, it sounded like a good time. Off on a long trip to Sanibel Island, 68 miles, about 8 hours of drive time. We will leave at first light and scoot on the outer side. I know we are missing things but we will come back in December and go to Ft Myers across from Sanibel island and rent a room and a boat for a few days. Up and off the Marker One Marina dock at 7:30 AM. It’s a nice day, another “hey I can wear shorts” day. It was a nice ride, we saw a number of sets of dolphins. We also fit under all the bridges so we didn’t need to wait for any openings!! Only interesting part was at Mile 110, where you can take a shortcut running along the I-275 causeway. We turned one marker too early and were in 5′ of water. That leaves 1.5 feet under the keel, plenty but not how I like to travel. We throttled down and coasted across to the channel. Twin Dolphin Marina is nice, super well protected and with floating docks. A little pricey at $1.75 a foot, but we are expecting that in tourist areas. The museum, planetarium and aquarium is a two block walk. The two major attractions for us is the aquarium, and Snooty the manatee. 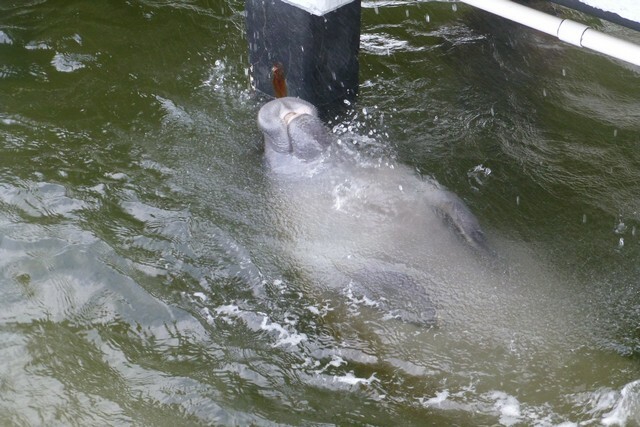 He was born 66 years ago and is the oldest living manatee on record. The average age in the wild is about 13-15 years. He is in a tank with two other “rescue” manatees. For the last 20 years they have taken in injured manatees and are the half way location before they are returned to the wild. We were able to see one of the 6 times a day feeding session. Each manatee eats about 10% of their body weight every day. Snooty clocks in at 950 lbs, he eats a box of romaine lettuce at every meal. The other attraction was the planetarium next door. We got to see two shows. The first was cartoon designed for kids. An insect shaped species with Mom, Dad, and three kids were from Rigel. They, along with the robotic real estate agent were looking at our solar system for some place to vacation. They tour all the planets. Lots of good graphics, good information and it was fun. The second show is a tour of the universe narrated by Tom Hanks. It’s more actual pictures as we move out of our solar system then out of our galaxy and into deep space. Very, very cool. About 5PM we were back on the boat and one of Susan’s High School friends showed up to visit. They brought Stone Crab claws and shrimp. It was a great meal and we had a great time chatting for the next 4 hours. 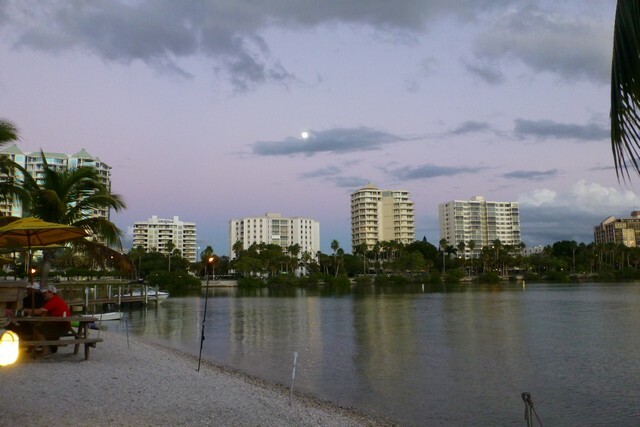 We will head to Sarasota in the morning (only about a 3.5 hour ride) and will tour the town with them. I don’t often post links to other videos, but this pretty much sums up the Canada VS USA beer issue. People ask me why do the loop. I respond “It’s for the people” We’ve met my Bayliner friends (Hi Terry and Doug) who helped us out of rough places and treated us to great diners. Loopers too many to name. Random town or dock people like the Dockmaster that turned a blind eye to our 4 day stay in Fenelen Falls ON. Or like Pierre that gave us his three favorite fishing spots (and we caught lots in them!) Or like the Tow driver that gave me a tour of their boat. The last 24 hours is a prime example. We got driven into Clearwater by a guy I met in Peoria, IL just because we were both loopers. We hooked up with two sets of crews on the Pier 60 boardwalk and had happy hour together. We were joined by a person that I worked with for 8 years back in the late 90′s She was one of my first employees and we worked together at 3 different companies. Back to the past to catch up and blast to the future to hear plans. Dinner tonight was with one of Susan’s friends from 20 years ago and her husband. They brought Stone Crab Claws, Shrimp, Salad, fresh bread and drinks. And suddenly we were back in the past, and then in the future, and it was a great time. Boating is nice, but the people are the best! After the overnight ride from Apalachicola we were tired but a little keyed up. The boats in our mini-group, Pier Pressure, Prime Interest and Errante met in the salon of Pier Pressure for Bloody Mary’s. We all had our secret mix like Sting Ray and Zing-Zang. By 11AM all the crews were ready for some nap time. The crew of Errante had figured out the trolly schedule and grabbed us to run to Tarpon Springs. We made the 4PM trolly with moments to spare. The ride was nice and inexpensive, $4.50 for the day pass. We got to Tarpon just as the Arts Fair was winding down. So we opted to go to the main docks, look at sponge and shrimp boats and then head for food. There was no activity on any of the boats (duh it’s Sunday) so we headed to “Hellas Restaurant” We had Greek Beer and the famous flaming cheese (shouting “OPA!! !”) to start. Followed by more food and more beer and some great conversation. Nice thing about the Loopers, we have wide and varied backgrounds, so there is always something new to talk about. We then cruised up and down the street getting pastries, spices, sauces, sponges and Christmas ornaments and of course I got Greek beer to try later. We were back at the dock just as the other Loopers were getting done with dinner. The crew of had a bottle of Templeton Rye, which was Al Capone’s whiskey of choice, to toast the successful crossing. We all had a glass and toasted the Loopers. The Rye was very good, very smooth. The next morning we got up and I power washed the boat to get the salt off of it. I was going to scrape it off and sell it to the Northern states for winter, but there was too much. While I was power washing, Susan had the bike off and was downtown with Linda. One of the cool things about my 4588 is that it has Hino engines. The US expert on these engines is Earl Summerville and he came over to check me out. I thought the turbo was about to go, he checked it out, it was fine. Yay!! We set up some minor maintenance to be done in January (new belts, new impellers and a new hot water heater). Earl had brought his wife Jolene, the four of us went to Frenchies about 2 blocks away. 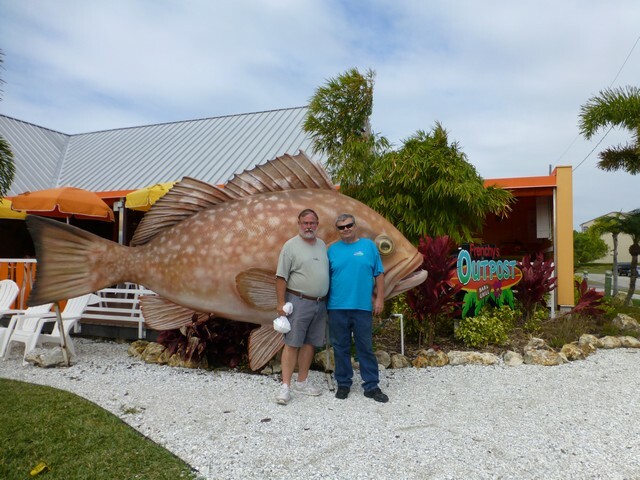 We gorged ourselves on Grouper, shrimp, oysters and cheeseburgers. Plus they had three kinds of beer that were not on my list. We got some great pictures of the Hino Guru and I with the fish, and then Susan and I with the fish. We walked back to Earl’s RV. It’s the same size as the 4588, it tows a jeep instead of a dink. There is a slide on the drivers side almost the entire length of the RV. A cool setup, maybe something to do when I can’t boat any longer. A short nap and then it was time for Docktails with our Duniden Looper Harbor Hosts Ron and Jan. We had met them on 23 September in Peoria (over 2 months ago!) Docktails were fun, there was quite a crowd of Loopers. We went into town for Mexican food at one of Jan’s favorite places, “Casa Tina”. We were with the crews of Errante and Ta Ta. Lots of food, lots of good conversation. Our original plan was to leave on Tuesday the second to do the mad dash down the Florida coast line. Instead we went to Clearwater, about 15 minutes away. Ron pitched in and gave us a ride over from the boat. First up was Thai food for lunch. This is something both of us have missed on the trip. Good Asian food is very hard to find. We then walked around the corner to “Winter’s Dolphin Tale Adventure”. “Dolphin Tale” is the story about Winter the dolphin. She is caught in a crab trap line and badly injured. Infection sets in and the tail fins are removed to save her life. A prosthetic vendor comes up with an artificial tail so she can get some rehabilitation and not end up fully crippled. “Winter’s Dolphin Tale Adventure” gives the behind the scenes look at both the real life activities and how they made the movie. It also talks about how the creation of a fabric (WintersGel) that wouldn’t chafe the sensitive dolphin skin has been a huge relief to 100′s of other prosthetic users. 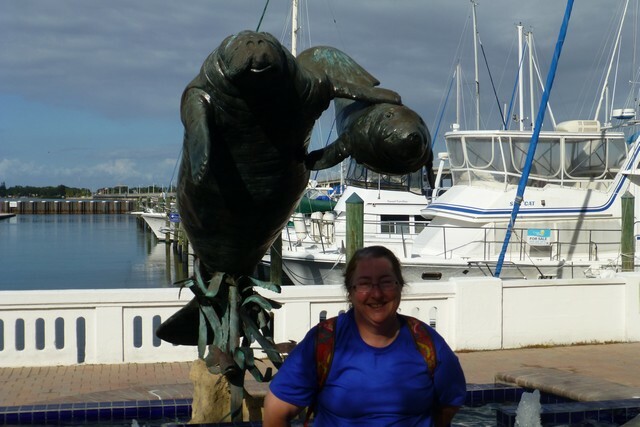 From there they take you across the bay in a tour boat to the Clearwater Marine Aquarium. Since we hadn’t been on a boat ride in 48 hours we were up for that! Clearwater Marine Aquarium is a combination of an aquarium and a sea life (dolphins, sea turtles and otters) rescue center. The star attraction is Winter the dolphins. We got to see her, but she wasn’t swimming with her tail. It’s weird how she does swim, more of a side to side wiggle than up and down. Winter has also been a great motivation to humans with prosthetics. The idea that a replacement tail could be built has pulled lots of people back into trying to get one. The WintersGel product has helped lots of people. What I found interesting was how they were training the sea turtles. There are three turtles and the trainers have three paddles. They have a triangle, circle and plus shape and are different colors. They teach the turtle that when they come to the right paddle they get food. From the Aquarium we got a trolly to the Clearwater beach. (I really love how these places have tourist friendly transportation. ) Clearwater beach is a white sand beach that is very, very pretty. While walking up to the Pier 60 fishing pier, I said to Susan “Hey, you should text Pier Pressure and see what they are up to”. A few moments later I turned and there were the crews of Pier Pressure and Prime Interest!! There may be something to this texting stuff. We hung out with them on the fishing pier admiring the views and talking about their day with the Florida Government getting temporary registrations. From there it was “Wine O’Clock” and we adjourned to “Crabby Bills” for drinks. About 6:30 PM my friend Wendy showed up. Wendy and I go way back to my Vanguard days (mid 90′s). To get more IT oriented kids into Vanguard I started a graduate program to do a 2 week indoctrination into Vanguard and the IT departments. Wendy was my first hire into that program. She holds the “shortest hire process” I talked to her at 9, walked all of her papers through the HR labyrinth and she had an offer by 2 PM. Which she accepted! Since then we have worked together at a credit card bank and at Kaloke. I had last seen her in 2008 when my daughters and I were down here for a trip. It was great catching up with her, talking about her family (how fast the children on both sides grow up way too fast) and jobs. Dinner was good too with oysters and crab cakes. After dinner she took us back to the marina with a short stop at the Dunedin Brewery so I could get a shirt. Sadly no beer to go less that a growler size. But the band was cool, it was 7 drummers and two maraca players. Had I joined the group, I would have reduced the overall average age by 15 years. Pretty wild. We gave Wendy a quick tour of the Quo Vadimus before she headed home. Glad that we stayed the extra day to catch up with Wendy! There were some Loopers out having one last drink and I joined them. From here, we all will split up and go different ways for the winter. Not sure if I’ll see any more Loopers on the water until we start heading north again in the spring.